Secure waiting stations for shipping & receiving dock areas. Help contain drivers and other facility visitors until properly admitted. These cages fit into a corner, providing a secure area utilizing two building walls and two wire mesh walls, plus the lockable door. You can situate it to protect a door on either of the corner walls, and mount your door on either of the cage walls. 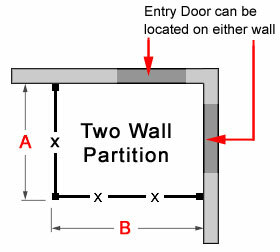 Your facility wall must be able to accommodate wall or ceiling panels to utilize a 2-sided partition without at-wall post connections. These cages are configured with posts. 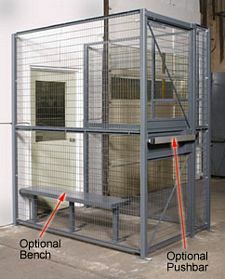 3-Side cages fit against a single building wall, providing a secure area utilizing one building walls and three wire mesh walls, plus the lockable door. 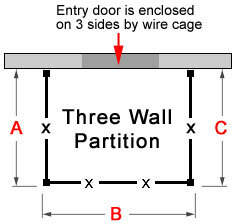 The door on these cages are mounted on the center panel at the end of your partition, but other configurations are available. Your facility wall must be able to accommodate wall or ceiling panels to utilize a 3-sided partition without at-wall post connections. These cages are configured with posts.